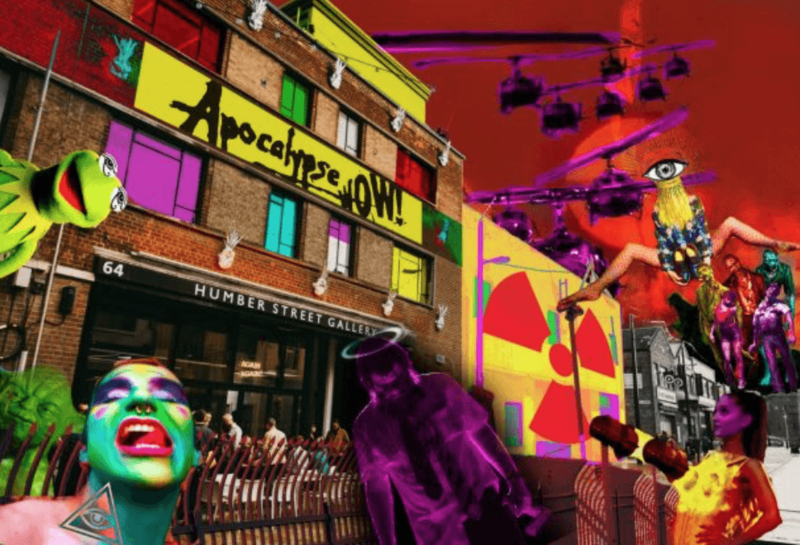 Live Art Bistro Present Apocalypse Wow! Ahead of the opening of Jamie Reid XXXXX: 50 Years of Subversion and the Spirit on Friday 12 October, this Saturday (6 October) Leeds-based Live Art Bistro will take over Humber Street Gallery, with a full-day programme entitled Apocalypse WOW. The day-long festival of performance art, activism and happenings embraces the aesthetics of fear and dismay that we are bombarded with on a daily basis, and reclaims this space as a point of departure. Taking liberal influence from its theological source material, APOCALYPSE WOW smashes it into contemporary themes and aesthetics. For 14 hours, over four floors, you are invited to revel in the apocalypse with hosts Live Art Bistro and a roster of talent from across the UK including Daniel Oliver, KP Culliver, Jim Burrows, Liddya, Adam Ekin, Adam Young, Sam Kennedy, Moa Johansson, Chillify the News, Edythe Woolley, Oozing Gloop, and Lady Vendredi. John Heffernan, Senior Curator at Humber Street Gallery, explained: “Last year, Humber Street Gallery played host to some of the most exciting and surreal performance arts events, including ReRooted and WORM Festivals. “Due to the popularity of these events and Hull’s long legacy as a birthplace of pioneering performance arts and artists, including Cosey Fanni Tutti of COUM Transmissions, and a new wave of arts collectives such as GROUND, we invited Leeds-based Live Art Bistro to take over the gallery on Saturday 6 October, with their exciting new full day programme titled Apocalypse WOW. “Everything from Kanye West, Preppers, #Metoo, North Korea, to Cambridge Analytica and The Windrush Scandal, will feed into an event that seeks to claim power and voice against the mounting existential threats we face. The event is free but ticketed. You’re welcome to turn up on the day but priority will be given to ticket holders. On 12 October, Humber Street Gallery opens its doors to its latest exhibition as it presents Jamie Reid XXXXX: 50 Years of Subversion and the Spirit, a retrospective look at the British artist and activist’s work. Spanning a career of over 50 years, Reid has become synonymous with the spirit of British punk with his signature newspaper-cutting graphics. This will be the first major look at the artist’s work filling three floors of the Hull-based gallery, including his iconic single artwork, unseen archival works and newly released pieces embracing spirituality and nature.